It’s the end of the first week of #RPGaDay 2017, there has been a massive response to this years RPGaDay, hundreds of videos and loads of blog posts with people getting involved and talking about the hobby. 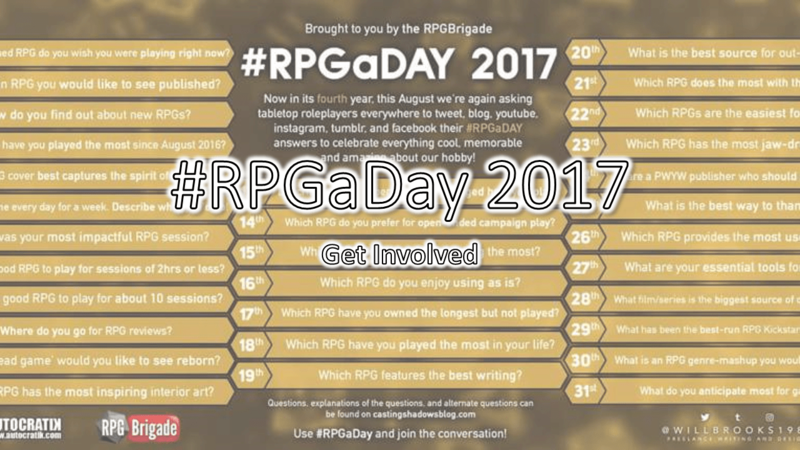 If you’re not familiar with RPGaDay, essentially during the month of August people answer a series of RPG related questions and produce content related to it, these could be videos, blog posts, tweets, however you want to approach it. The idea of RPGaDay is that it gives us all an outlet to enthuse about this wonderful hobby of ours and share that enthusiasm with others, the side benefits are that we get to find out about cool new Youtube channels and also get to learn more about our fellow RP enthusiasts. If you want to know more about RPGaDay, I’ve done a post at the start of August that you can read by clicking here. Please note: This video was entirely created by Runeslinger, I’m just sharing the love. I don’t want to retread ground that Runeslinger has already covered–since he did his usual excellent job with the week 1 recap video–so I’m going to talk a little but about what RPGaDay means to me and then finish off this post with some of my favourite videos that have been published so far. This is by no means a comprehensive list, it’s just a few videos that stuck out or struck a chord with me. RPGaDay to me is a though-provoking and sometimes infuriating exercise, the questions are always interesting, some of them I have to think about for a fair old while and others I feel like I’ve not really answered the question in full, either because I can’t, I’m not sure how, or because I have too many potential answers. However the questions always feel worthwhile to me, even if I struggle with them or end up giving an incomplete answer, it gets me thinking about this hobby that I love, often in ways that I may not have done were I not taking part in RPGaDay 2017. For example: The most recent question (as of time of writing) was Describe a Game Experience that Changed How You Play, I struggled with this one for a while since I think that you inevitably tweak and evolve your playing style during games even if you aren’t consciously aware of the lessons that you are learning. Although I did struggle to come up with an answer, by thinking about this subject it made me consider the way that we learn things in RPGs and how that affects our playing style going forward, even if I’d not managed to come up with an answer at all, thinking about it in this way has helped bring something from the back of my mind to the front and made me more consciously aware of it, this can only be a good thing. Michael Guerra went a different route and used a simple graphic to show his choice of game for Day 5’s question. Sophie Lagacé has published some great responses to RPGaDay 2017 on her blog, you can find the blog by clicking here. Create a single post or video that answers the questions you missed, you can be as brief or verbose with your answers as you like. Start with the current questions and then go back and fill in the missing ones when and if you have time. Just don’t worry about it, start putting out content at whatever pace is comfortable for you. 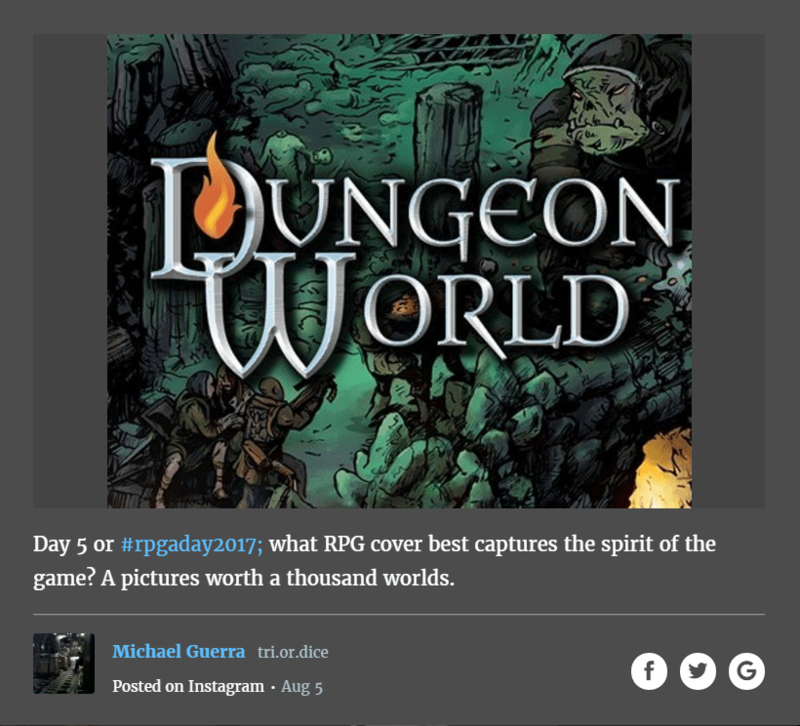 RPGaDay is a great way to reminisce about your RPG history and also to engage with other members of the community, we’re all talking about the same great hobby so–as well as making your own blog posts or videos–make sure to comment and get involved with other people’s, don’t forget to use the hashtag #RPGaDay. Even if you don’t manage to do a post a day, or whether you cheat and film/write several at once (like I do if I am really busy), that’s not important, what’s great about RPGaDay is that is gets everyone in the community involved and talking about this great hobby of ours.